It was a lovely bright – though freezing cold! 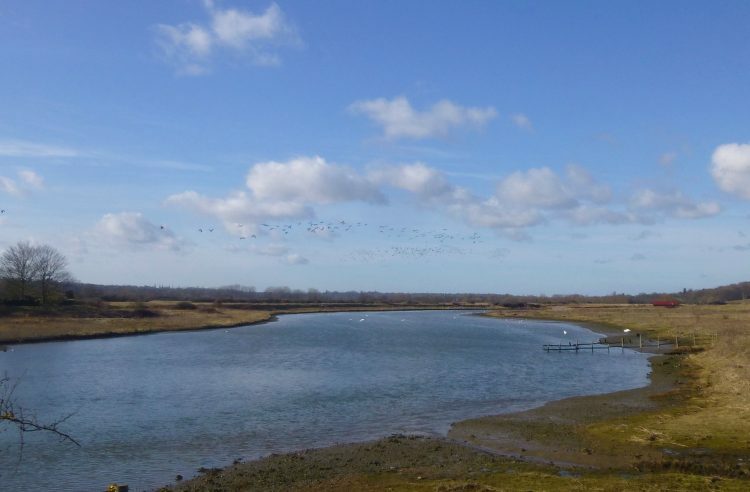 – morning today so I drove up to Cattawade on the Stour estuary. Just over the Suffolk side of the river there is a handy gateway. I pulled in and left the car there, then walked back over the White Bridge. This is the view from the bridge looking upstream. 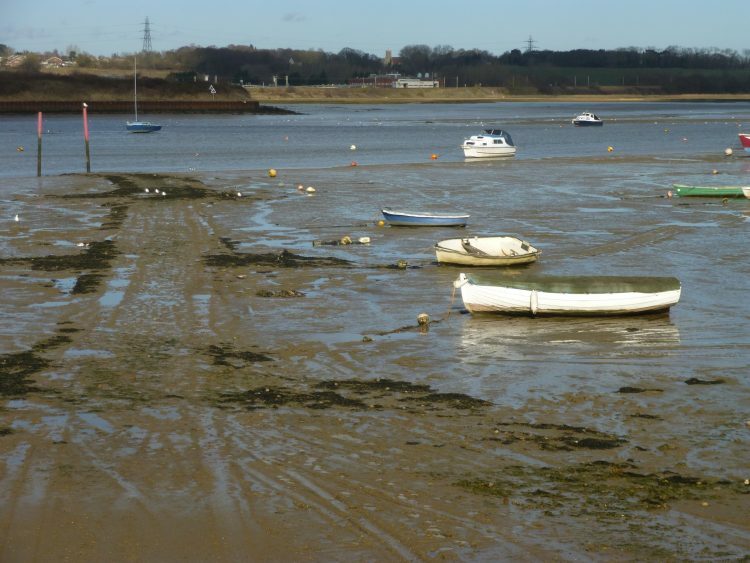 Compared to the estuary at Wrabness, the Stour is much more ‘river-y’ here, much narrower, no waves and no sand! After a bit of walking around I stood on the White Bridge and drew the view from there. This is what I shall be painting for my next Winter picture for my Four Seasons on the Stour project. There was a lot of bird life to be seen. A row of cormorants sitting on the jetty that can be seen in the right middle distance of the photo above. A pair of mute swans. A big mixed flock of pochard and mallard. A small group of Brent geese flew down the estuary. And a large swirling flock of lapwing lifted off the river bank and flew around for a while, landed, took off, and did it all again. If you look carefully you can see them above the river. At one point they flew overhead and I got a really close up view. On the other side of the White Bridge there is a huge sluice, with danger signs all over it, and on the other side of that is the railway bridge. This takes the mainline trains from London to Norwich. Periodically one rumbled across while I was there. I can remember a very, very long time ago travelling by train backwards and forwards to Norwich when I was at college there. On the trip I always watched out for the estuary and all the birds on the tideline, especially the beautiful shelducks. And they were still there today . . . 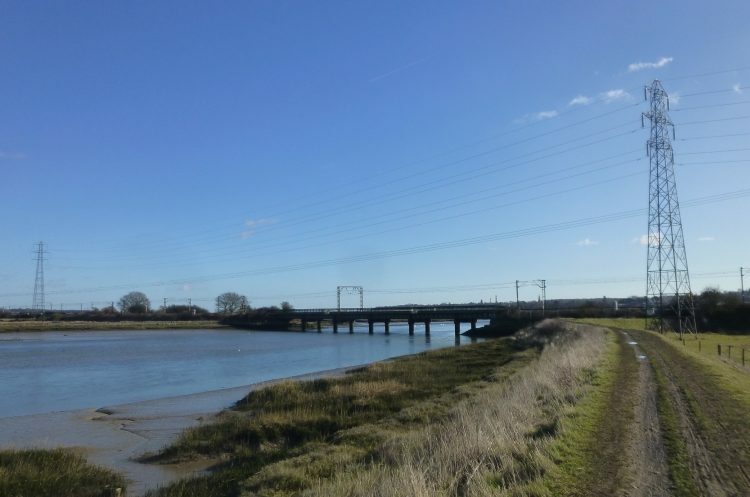 When I went round the other side of the railway bridge, into Manningtree, there were a lot more waders here. Redshank, greenshank, black tailed godwits, knot, oyster-catchers.